So what’s wrong with big reactors? I’ve already discussed the safety implications of large reactor cores (see section on LWR’s). There also the issue of decommissioning. The current plan is to remove the fuel and then strip down the interior of the reactors pressure vessels, fill it with concrete…and leave it there….for a century or two. Enquire with a nuclear engineer about what they plan to do with our vast concrete sarcophagus at this point in the future and they’ll make some vague reference to picking it up and sawing it into pieces…and how exactly do you propose to pick up a 20,000 ton block of 200 year old (mildy radioactive) concrete and steel (without it fracturing) and then cut it into pieces? I’m assuming that nuclear engineers are gambling on us developing phasers and tractor beams over the next 100-200 years! Obviously small to medium sized reactors reduce the problem. Several such reactors, the Shippingport reactor for example, were successfully loaded onto barges and moved to somewhere that they could be safely buried. One could even envisage us putting some of the smaller pressure vessels into out deep geological storage facilities, if they can be made small enough to transport. So smaller reactors give us a lot more wriggle room as we come around to decommissioning. Another problem with these large reactors is that that they are impractical and unwieldy. Only a few of the larger nations on Earth can utilise them, as only they have an energy grid large enough to support large reactors, not to mention the financial muscle to pay for them. I recall a talk I saw in Ireland by an advocate of building nuclear power stations in the Republic. He gave as spirited a defence as I’ve ever seen of the nuclear energy issue, although he inevitably glossed over a few issues (the costs, decommissioning problems, spent fuel storage – he seemed to believe we could export nuclear waste abroad, which we can’t, that would violate IAEA rules) but gave a good account of it. Unfortunately his entire hour long talk fell apart in the last 5 minutes when he turned his attention to picking the reactor type. He noted that a single EPR or AP1000 would be impractical, we’d want a minimum of two of any reactors (unless we want to turn off half the lights in the country when its offline!). Unfortunately, 2 of either of the above would drastically stretch the Irish energy grid and probably not be practical. He favoured two of the AP600’s (since cancelled) or possibly several of the South African PBMR (also cancelled) if they became available. In short, what he seemed to be saying is nuclear power in Ireland is off the table at present because the reactors are just too darn big! In another example, take Lithuania. They are probably one of Europe’s most enthusiastic supporters of nuclear energy. It pained them to have to turn off the remaining RMBK station in the country as part of the price for EU membership. They have been trying since without success to bring in another pair of reactors. But again they have the problem that they are a small country with neither the financial resources nor the grid capacity to manage two large reactors. Thus, they’ve been forced into a bilateral agreement with they’re neighbours, Latvia, Estonia, even Poland, to both finance this project and distribute the electricity. Of course, as always happens when governments get together the whole thing has dragged on and on! As a consequence they have yet to put ink to paper and actually order any reactors. Obviously if small to medium sized reactors were available, they could have 2 or 4 of said reactors up and running already. Finally, as we will discuss later in this chapter, large reactors often need large engineering workshops to forge and manufacture critical parts. There are only a handful of faculties worldwide that can actually forge key parts of a reactor, such as the pressure vessel for example. Obviously this puts a significant bottle neck on potential nuclear roll out, and makes many countries dependant on foreign support. China for example, even if they can develop their own indigenous large LWR will probably need to get the pressure vessels forged in Japan, something that is unacceptable on a political level. Indeed it’s interesting to note that all of the Chinese reactor development programs (that we know about! 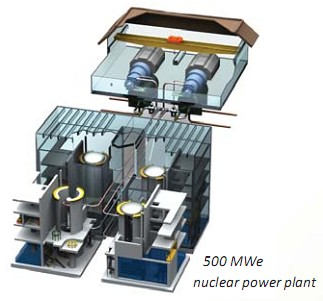 ), involve small to medium sized reactors. Another issue is simple grid mechanics, as we can get more of them on the grid and use them more effectively if we have lots of little reactors rather than a few big ones. Better still if one of the smaller reactors unexpectedly goes offline for some reason, the consequences aren’t as catastrophic as with a big reactor suddenly shutting down. Finally there is the fact that some reactors, notably the HTGR would work better with small or medium sized cores (as discussed earlier). So there are a host of practical factors in favour smaller reactors. But what’s the down side? Firstly, economies of scale. With a small reactor, we have all the excess baggage that comes with each power station, all the fixed costs and a much smaller pay-off. As I noted earlier, even thought many smaller reactors are a lot safer than large LWR’s (even a small LWR is somewhat safer!) you would still need to put them under a containment dome. It’s this process of concrete pouring that is often a bottle neck in nuclear reactor construction. We could get around the problem by clustering reactors together, i.e putting 2 or 4 reactors not only on the same site but under the same containment dome. The one downside here is that if one reactor has a problem, it will likely spread to its neighbours. How much of a showstopper this fact is depends on which type of reactors we are discussing. Also, in the shorter term small reactors would be slower to build, especially many of those we’ve been discussing, given that they are often made out of non-standard materials. Only a few facilities in the world could build them as the entire nuclear manufacturing industry is currently geared towards large LWR’s. Turning that juggernaut around would take decades. So by opting for small reactors while we’d get safer more flexible reactors, we be paying for it, as these reactors would be slower to build and probably more expensive too. There is a common misconception, that we could solve a lot of the problems with reactor construction, both large and small (though in particular the small ones) by building them in subsurface pits. I’m assuming the person who thought up this one has never dug a hole in his back garden! If you have, you’d know that digging a hole is not as easy as it seems. Firstly, the soil type has a big bearing on things. Depending on where you live you could be looking at thick sticky soil that difficult to shift, loose gravely soil that collapses easily or rocky earth, that rapidly turns into bedrock (so after a while you’re not digging any more but blasting!). As we need to put foundations down under out reactor to suit the soil type, and probably piling too (due to its weight), this means we essentially need to design each reactor’s containment vessel individually to suit local soil conditions, which increases costs. Another problem is water intrusion, as anyone who’s ever dug a pit, then gone in for lunch, come back out and found it full of water will know all about! Our reactor “pit” needs to be designed like the hull of a boat to stop water leaking in and flooding it. Doing that with concrete, particularly thick section of it, is always difficult. The fact that the reactor will be generating heat complicates things as it raises the risk of subsidence or settlement cracking. While this can happen if the reactor is on the surface too, putting it under ground level “complicates things”. In general with any construction project significant efforts are made to reduce the amount of earth movement required to start construction, not increase it, as lots of earth moving nearly always results in delays, hold-ups and ultimately higher costs (not the least of those being the cost of hiring out of earth moving equipment, those guys charge an arm and a leg!). 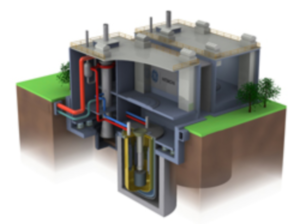 Overall, except in a small number of narrow cases building reactors this way will often work out as more expensive and slower than just putting the containment dome above ground.